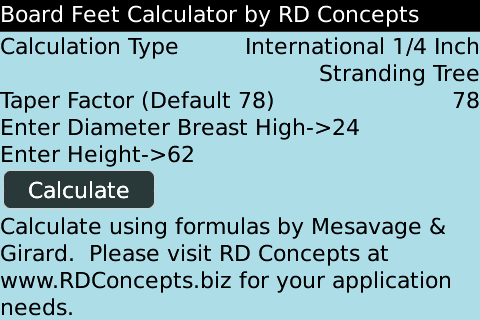 RD Concepts wanted to bring the ability to calculate board feet of standing trees and logs. We provide the ability to use the three board feet calculations used in the United States of Doyle, International, and Scribner for the calculations. 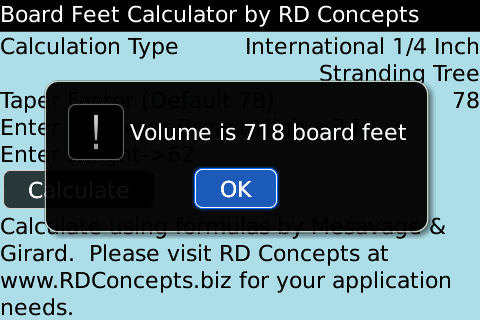 By allowing this on the BlackBerry phone, the board feet calculator allows mobility to any user to estimate the board feet of standing trees and logs. The calculator will account for the taper factors of standing trees also to provide the most accurate estimate. Diameters up to 99 inches and heights up to 99 feet give a wide range of tree sizes to calculate for. The log rules are also based on the three currently recognizable rules of Doyle, Scribner, and International. The calculations for standing trees correspond with the volume tables given by Mesavage and Girard for the Doyle, Scribner, and International rules. By providing this ability, a valuable and mobile estimating tool is given to both users within the forestry industry as we as a novice who would like a quick estimate of a tree. To download the Java Application Descriptor and code listing files within a zip file, please select zip. 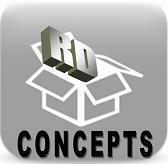 RD Concepts utilizes the honor system for our software products. We suggest a fee of $1.99 for each install to utilize this product, but we appreciate however much you feel comfortable with. You can make a payment via PayPal. For demonstrations of our software, please visit our YouTube channel.